Before I get to the main review of this DVD I wanted to offer a bit of background on the legend of the Bermuda Triangle, as well as explain why the stories seem to have vanished, mysteriously, from the media in the last 30 years. The Bermuda Triangle represents nearly a half-million square-mile area of ocean roughly defined by Bermuda, Puerto Rico, and the southern tip of Florida. The term "Bermuda Triangle" was first penned by Vincent H. Gaddis in an article for Argosy magazine in 1964. Sadly, a lot of the legend is pure cobblers - fuelled by lazy journalists and authors who haven't bothered to do their homework properly. Many of the vessels that are claimed to have vanished in calm seas did nothing of the sort. In 1975 Larry Kusche, a librarian at Arizona State University, became intrigued by the legend and took it upon himself to investigate the claims made by many of the published books and magazine articles. His results can be read in a book entitled The Bermuda Triangle Mystery Solved. He discovered that on frequent occasions when a writer had given an account of a ship or plane that had disappeared in calm seas that the actual official records showed that a raging storm had been in progress. More digging revealed that many of the mysteriously vanished ships and planes had done nothing of the sort. Their remains had been found and the cause of the accident had been officially explained. In 1975 the editor of Fate went through Lloyd's of London's accident records and discovered that the Bermuda Triangle was a no more dangerous part of the ocean than any other. A quick check of the U.S. Coast Guard records confirmed this and since the '70s the Bermuda Triangle mystery disappeared... mysteriously - until now. Okay, history lesson over. The Triangle mini-series is an intriguing piece of TV science fiction that while 30 years too late in the making, is actually rather entertaining. It is one of those rare US television events - a mini-series that has no (or almost no) chance of being turned into a spin-off series. This is quite impressive - that the studio stumped up the cash for a made for TV production that, if popular, can't be expanded upon very easily. In fact, after listening to Dean Devlin and Roland Emmerich's remarks on the audio commentary of the Stargate DVD, I actually wondered if Devlin deliberately orchestrated this series so that it was near impossible to make a spin-off TV show on the back of it. For those of you who haven't heard that audio commentary, basically the two skirt around their dislike of the more popular Stargate: SG-1 TV series. The acting is near faultless with Eric Stoltz, Catherine Bell, Bruce Davison, Lou Diamond Phillips, Michael Rodgers and Sam Neill all being wonderfully cast. A loved the fact that the main group was not Benirall's originally choice - that he'd already approached much more qualified and disciplined experts in each field, but that they had all dismissed his proposal as the quest of a mad man. This mini-series also touches on the myth that is the Philadelphia Experiment. For those unaware of the background to this, it is claimed that in 1943, as part of an experiment into electronic camouflage, the U.S. Navy destroyer USS Eldridge was made invisible and teleported from Philadelphia, Pennsylvania, to Norfolk, Virginia and then back again in a flash. On returning to Philadelphia it was discovered that some of the crew were violently sick, others had vanished never to be heard from again, some went crazy, and five men were fused within the ship's structure. It was interesting to see the writers link this myth into the plot. I said earlier that it would be difficult to make this into an ongoing series, but personally I think that they could spin this off into a TV show. Skip the rest of this paragraph if you don't want a big clue how this series concludes... Without giving too much away, an ongoing series could easily use a Stargate:SG-1 type format, but instead of travelling through space they could go through time. For some strange reason the episodes are entitled Night 1, 2 and 3. This is a little strange because very little of the action takes place at night, and the majority of this series is set during daylight hours. Extras are a little lacking. All we get is a "Making of" featurette and rather uninteresting interviews with the main cast. 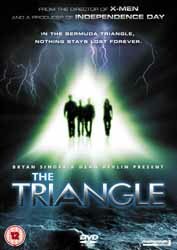 At the end of the day, The Triangle is pretty entertaining viewing and certainly worth adding to your DVD collection.